So I tried my best to not to get sucked in. I really didnt need another addiction. 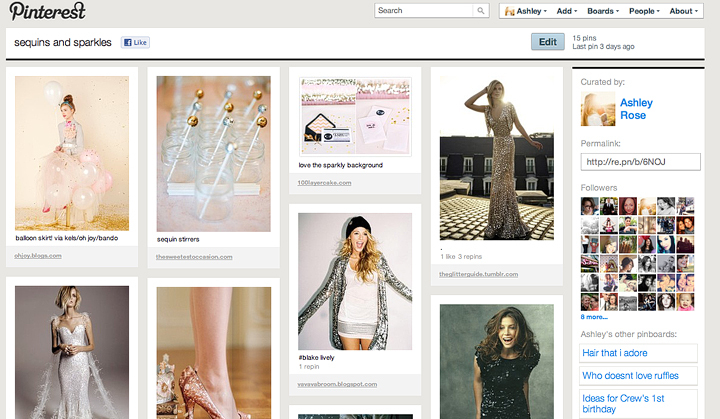 But I succumbed to the amazingness that is PINTEREST. And now I am OBSESSED. really. really. OBSESSED. It's sooo addicting and fun!!!! Chalk full of inspiration for pretty much everything! So if you want to check out my pins - click HERE ! yup. I am a sucker for anything sparkly! looks awesome. how do i join? I recently got sucked in too! I was wondering, how did you join. I had to request an invitation and still haven't heard back from anyone on how to sign up? Any advice would help!